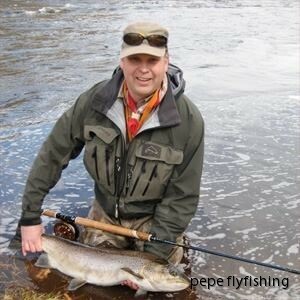 PePe Flyfishing is a small company with great knowledge and personal service. We, who runs the business, are trying to live a normal life with family and another full time job, even if fishing is more of a life-style to us. Pär Palm is a “wily old bird” when it comes to fly fishing. With more than 20 years of experience he can handle everything from mosquito imitations on a # 3 rod to sinking lines on heavy double hand poles, and everything in between. Sea trout fishing in Sweden and Steelhead in the US are his favourites. Salmon in Sweden, Norway and Scotland comes on a regular basis. In spring time he will occasionally challenge a pike or two. Since many years Pär has a rumor of being an innovative fly tier and a very skilled rod designer..
Anders R. Öberg came a little later in to the game. He commenced serious fly fishing 10 years ago. Two hand rods in different length and classes are his first choice. Salmon, sea trout and steelhead are very different challenges, but just as fun according to him. Anders main contribution to the business is planning, administration, public relations and economy. He will also take lead in some of the fishing trips.